DBS offers a wide variety of basement flooring options for homeowners in the Duluth Superior Area area, including ThermalDry® flooring tiles. With these products, you can be sure your basement floor is warm, comfortable, dry, and mold free. If you want to get quality waterproof flooring for your basement, call us today at 1-855-259-9625! We offer free estimates on all work in Superior, Duluth, Minneapolis and the nearby areas in Minnesota and Wisconsin. If you've been trying to find the right flooring for your basement, look no further! Our quality basement flooring products will provide you with the waterproofing qualities you need and the warm, comfortable floor you want. 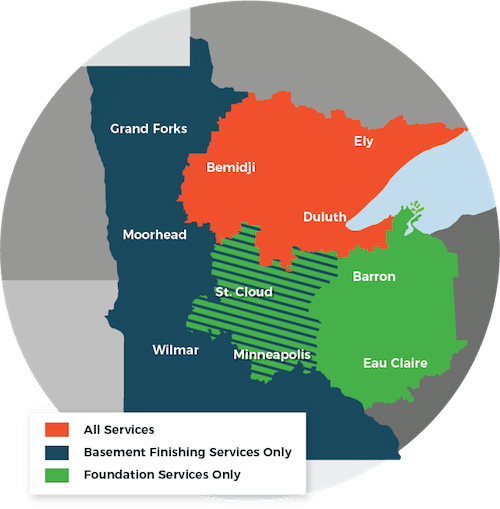 Call us today to get a free estimate in Minneapolis, Superior, Duluth, Two Harbors, Cloquet, St. Paul, Hermantown, Virginia, Ashland, Esko and throughout Minnesota and Wisconsin.